I was staggered his article in the National, to use language such as "economic suicide" is unbelievable considering he's now an SNP MP and is supposed to be arguing for fiscal responsibility (nee autonomy) as per the SNP manifesto. Maybe he didn't get the memo? Strikes me that Full Fiscal Autonomy means Full Fiscal Autonomy. I somehow doubt that the rest of the UK will just happily hand over a continuous stream of bail-out money while letting Holyrood borrow what it wants. It's exactly the same reason why HMG refused a post-independence currency union. And if Holyrood cannot borrow what it wants, Scotland will not be fully fiscally autonomous and the SNP will not accept it as such. But on the wider point, I think it's worth pointing out that giving territories Full Fiscal Autonomy is not a new idea for Britain. We just don't call it Full Fiscal Autonomy. The relevant territories are called British Overseas Territories and Crown Dependencies. And one of the features of that status is that the BOTs and CDs have no representation at Westminster at all. Full fiscal autonomy is a model that gives all the risks of full independence but none of the benefits. Scotland rejected independence 8 months ago largely because of those risks and there is no reason not to respect that decision. Turn to drink. Thats what I did on Thursday night. I think an alternative interpretation is that he recognises the need for cross-border fiscal transfers in the sense of UK wide taxes and spending. He isn't really arguing for 'full fiscal autonomy' at all, in other words. "To deny that to Scotland suggests a disingenuous Mr Cameron is hoping to derail any move to Scottish *Hole* Rule within the UK"
He's just been wriggling on Radio 4 about FFA. I've just discovered your excellent blog. Via the GERS data you make it clear that were Scotland to choose Independence, it would choose also a substantially lower standard of living – I suspect beyond what most people can even begin to imagine. Anyway, via Mr Kerevan MP, there seems to be SNP recognition that it would be “suicidal” for Scotland to vote for full financial autonomy (isn’t that what a “Yes” vote last year would have delivered! ), because that would mean losing the apparently essential financial support from r.UK (the “enemy”!). It's quite clear that the SNP are rapidly dumping DevoMax or FFR and are trying to go for something in between. To be honest if it's similar to the n56 Fiscal Autonomy which is de facto Smith with GERS as statutory accounting treatment of the Scottish Government revenues then that's fine with me. But let's be clear that isnt DevoMax or anything close to it. I took it from what Michael Forsyth said on R4 Today this morning that he favours Cameron granting FFA and then watching the decimation of Scottish public services. @Neil Novatt "It's quite clear that the SNP are rapidly dumping DevoMax or FFR and are trying to go for something in between"
Indeed - Kerevan, Angus Robertson and Nicola Sturgeon all seem to be pushing this line. Funny how SNP policy has effectively gone from "independence now" to "souped up version of the Smith Commission over a five-year timescale". Try chanting that one on a demo! 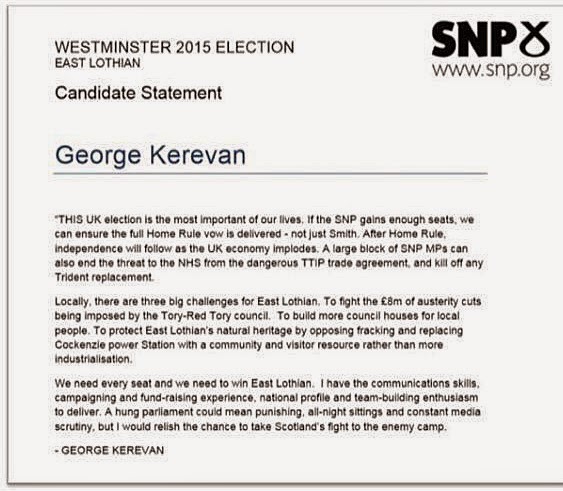 I am sure you will enjoy, George Kerevan's maiden speech in Westminster on CD which I am sure he will send to you. As a special treat you may even get a box set of all new SNP MP's maiden speeches. Just a question - doesn't England itself have a deficit? Who bails it out? The point is that we can equitably run the *same* per capita deficit as rUK under an FFA agreement - the problem is our per deficit will be £8bn *more* than that. Brilliant blog post as ever. Like the other commenter @finarne, I was also staggered to read the article in The National. In fact I had to read it a couple of times to believe what I was reading. That he expects rUK to bail out Scotland if and when FFA goes belly up, as well as saying the reason FFA wouldn't work is because of the UK economic situation (completely ignoring the fact that it is the deficit difference compared to rUK that counts, not the actual deficit)! Wow. Kerevan's columns in the Scotsman used to be worth reading; he is one of the many ex=Trots turned supporters of capitalism. However, his writing has deteriorated and is dominated by the belief you allude to; that the UK economy will implode and that Scotland will survive better than England. Still, it is good to see another Drumchapel boy get to the House of Commons. Full interview with George on Westminster Hour here (available for 30 days): http://www.bbc.co.uk/programmes/b05tcmvq About 28 minutes in. What a load of waffle. George, I did read it and did understand. But my point was that England has a deficit which must at some point become an even more serious economic problem than it is now. We focus on the IFS analysis of a potential problem with a version of FFA. There is a problem rushing toward us from the English and UK deficit. Sorry but I cannot make sense of your comment. The "English" (sic) deficit on a per capita or %age GDP basis is running about about half the level that an FFA Scotland would have and it is decreasing (albeit not as fast as was planned). There only problem "rushing toward" us is the loss of the benefits of spreading our higher per capita costs across the whole of the UK (a pooling and sharing benefit that would be lost under any sensible definition of FFA). A very interesting blog post, as usual. Whilst hoping world will spread that the fiscal argument put forward by the SNP for the referendum and the election has been exposed for the "bluff and bluster" it always was, I note efforts are being made to shut the blog off from a wider audience and malware is signalled when I try to visit the site. It's not just the SNP's financial promises that were a lie, so is any interest in freedom or fairness. I honestly cannot believe that people still follow the SNPs 'we'd be better off under indy' rhetoric when he is actually SPELLING IT OUT TO THEM that we'd be bust in their beloved 'national'! It is quite something that an SNP MP can say that independence (which is impossible without full fiscal autonomy) would be economic suicide and yet people still campaign for it. I was never against the kind of identity-driven, flag-waving independence idea in principle. In fact I voted for the SNP in 2007, partly because I was duped by some of their promises on things like student loans that they never bothered to implement. But we're now talking about a movement that's completely incoherent - one that admits what we're campaigning for would bankrupt the country under present circumstances, but calls for it anyway. Would your view on independence or FFA be different if we were in an different economic position i.e. if the GERS figures were more favourable? If not, then you have to admit that it is idealogical rather than purely financial motives that drive you. What drives most people now who are in favour of FFA and eventually independence in my circle, academics of mixed backgrounds, is that we are never going to be in a better position unless we take control ourselves. Westminster have no interest in allowing our economy to flourish if it has any detrimental effect elsewhere in the UK. Which is ironic considering their Londoncentric policies do exactly that. For capitalists, what are they afraid of? Competition? That we might succeed? We can all admire your dogged intransigence but please admit it is because you are doing well out of the present system. Statistics can be shown to portray anything you want and for you to say there is no other interpretation is disingenuous. You are portraying 'sums' and snapshots should the situation stay the same, not political or economic arguments. Anon 14 June, please explain in what way a flourishing Scotland could or would be to the detriment of the rest of the UK, and why Westminster should wish Scotland not to thrive as part of the UK? Any evidence? That just sounds like the tired old conspiracy theories about how Scotland is perpetually being put down by the bogey-men in the south-east. The thing about ideologies and principles is that they always - eventually - come at a cost. No matter how lofty the principle, the finances matter, especially when they are being deliberately glossed over. In this blog Kevin hasn't argued an ideological position at all that I can find, simply for the honest presentation of the facts to the people of Scotland. 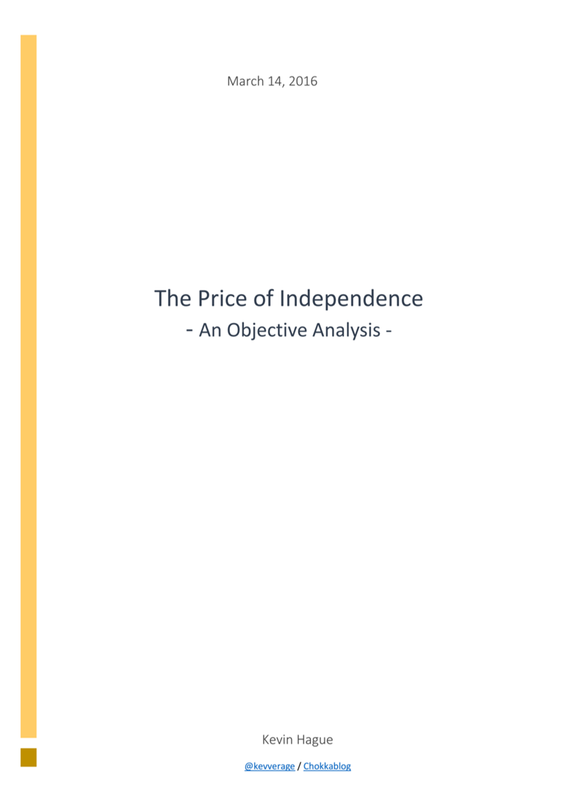 Your suspicion of ideological bias may well derive from the fact that the most blatant and inexcusable dishonesty and distortion he has uncovered has come from those attempting to make (up) the financial case for independence. The old chestnut about statistics would perhaps stand up if statistics were in play here, but they're not. What we're dealing with are hard and verified financial data. Where extrapolations are made the blog has consistently referred to GERS, OBR and HMRC sources for figures. Those guilty of selective snapshots are the SNP, BfS and WoS, where the real "dogged intransigence" resides. I salute Kevin for calling them out on their fabrications. So is he a closet Communist dressed up as Nationalist ? HE boasted that he would only take a percentage of his MP’s salary to ensure he was in line with the average Scottish wage. 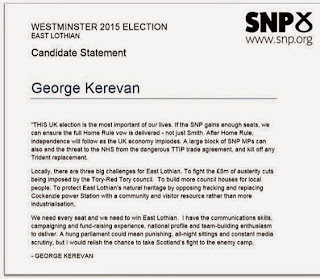 Nationalist MP George Kerevan swept to power on a crusade to clean up politics and make Westminster l ess remote f rom the public. Yesterday, it emerged that Mr Kerevan had remained true to his word by drawing only two-fifths of his wages – but an extra £20,000 of taxpayers’ cash was still coming into the family home. He has taken advantage of the rule allowing MPs to employ relatives by hiring his wife. A standards watchdog said the practice should be abolished following the expenses scandal. Yesterday he strongly defended her appointment, insisting it was competitive and that she ‘effectively’ works a 50-hour week. But Conservative MSP Alex Johnstone said: ‘This highlights yet more hypocrisy from the SNP. George Kerevan was very vocal about cleaning up the expenses scandal yet here he is employing his wife. There were calls for an Independent Parliamentary Standards Authority (IPSA) crackdown on MPs hiring relatives following the expenses scandal. Sir Christopher Kelly, chairman of the Committee on Standards in Public Life, said in 2011 he was concerned at the ‘ potential for abuse’ in such arrangements. However, Mr Kerevan is far from alone. An estimated one in five MPs, including several Nationalists, employs relatives. Western Isles MP Angus MacNeil’s wife Jane is his parliamentary assistant and caseworker. Paul Monaghan, MP for Caithness, Sutherland and Easter Ross, employs his brother as a communications manager. Corri Wilson, MP for Ayr, Carrick and Cumnock, employs her son as a caseworker. And Anne McLaughlin, the Nationalist MP who represents Glasgow North East, has faced criticism for hiring her long-term partner to work with community groups in her constituency. Mr Kerevan, 66, was particularly vocal in a 2009 Scotsman column about the need to tackle an ‘insidious political culture’ at Westminster, where MPs claim for luxuries such as patio heaters and become ‘too remote from the people’. After being swept to power in the SNP tidal wave last year, the former member of the International Marxist Group boasted about taking an average salary. ‘I take only the Scottish median wage which is circa £27,000. I also have a state teaching pension,’ he said. Yesterday, he did not respond to questions about how much money he had given to charities and which causes he had supported.